It’s great when two foods I love can join together to form an entirely new delicious creation. It’s worked for Buffalo Chicken and Enchiladas, Tacos and Pasta, Cheeseburgers and Pizza, Cheesecake and Popsicles, Chicken Parmesan and Meatloaf, Pumpkin and Macaroni & Cheese, Spaghetti with Meatballs and Soup, and now, Pizza and Breaded Chicken. 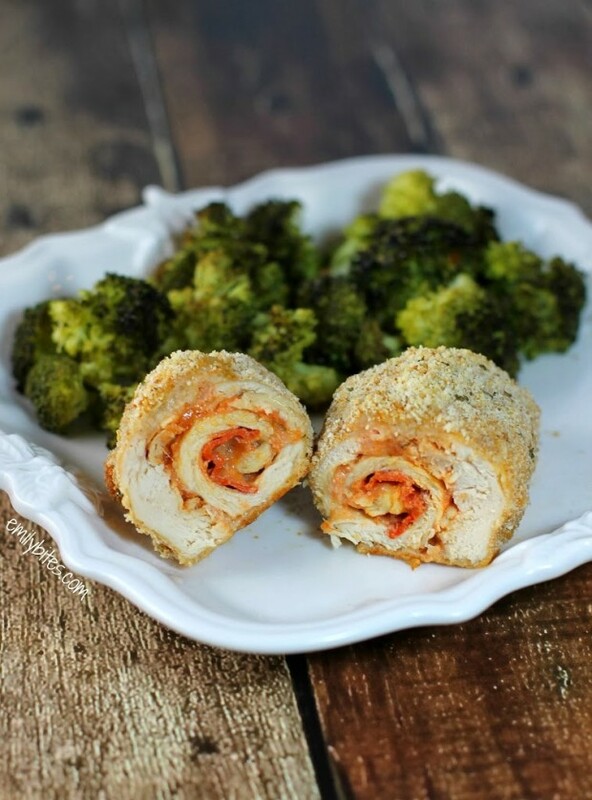 These Pizza Chicken Roulades are a great entrée because it’s easy to make and sure to be popular with adults and children alike. Cheese, pepperoni and sauce all wrapped up in a hearty chicken breast and coated with crunchy bread crumbs? Sign me up! It’s even easy to customize. If you’re not a pepperoni fan then feel free to replace it with your own favorite pizza topping. Like things extra saucy? Serve it with some extra pizza sauce for dipping. It’s also simple to double or triple this recipe if you’re serving more than two. Place the chicken breasts on a cutting board. Using a meat mallet, pound the breasts to a ¼ inch thickness. Spread 2 teaspoons of pizza sauce across the surface of each breast. Top the sauce on each breast with half the Italian seasoning, three pepperoni slices and a tablespoon of the shredded cheese. Starting with a short side, roll each breast up and seal the edges shut using a few toothpicks. Place the rolled and sealed breasts in a Ziploc bag and add the flour. Lightly flip the bag around until chicken is coated. Place the beaten egg white in a shallow dish. In a second shallow dish, mix the bread crumbs and Parmesan cheese. Remove each rolled breast from the flour bag and dip it in the egg white, turning to coat. Then move the coated breast to the breadcrumb dish and coat it with crumbs on all sides. Place the completed rolls seam side down on the prepared baking sheet. Can’t wait to try this! Emily you are the reason I’m successful with weight watchers – thank you!! Emily…you ROCK!!! I cannot wait to try these for dinner tonight. All of your recipes I have tried have been winners. Bacon cheeseburger wraps are on the menu this week as well! You continue to be my “go to gal” for meal planning! OMG!!! These were amazing! My father-in-law came for dinner last night and he couldn’t believe the taste. Thanks again for the great recipe! Thank you for all the yummy recipes you have created!! Quick thing though, I put this in the recipe builder for weight watchers and it came out at 9 points per serving, not 7, and I put it in with the fat free shredded mozzarella cheese not the 2%. Dont know why the discrepancy. Do you have any idea?? Hm, I;m not really sure what you’re doing wrong since I can’t see what you’re entering but I’m positive it’s 7 PP and not 9 PP. 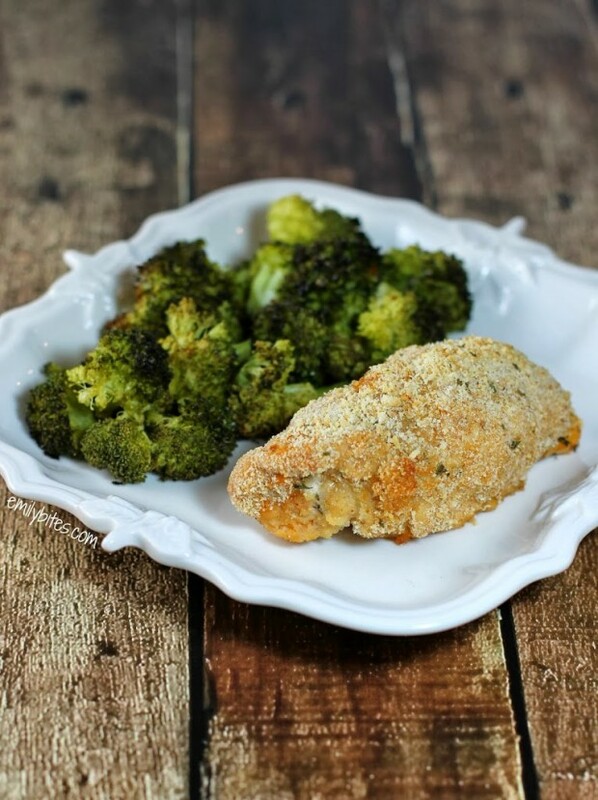 Could you be entering the chicken breast weight cooked instead of raw? Ahhmazing! Made these for dinner tonight with mashed potatoes and fresh artichokes. Family loved it! These are awesome! I made them tonight for dinner and event my husband (not a ww guy) loved them! And an added bonus – super easy with a lot of ingredients that are around the kitchen! Thanks Emily! I have these in the oven now 🙂 I’m sure they’ll be great, but I’m a pretty lazy cook and these were A LOT of work for me. Love your recipes though and will continue to try them!! Thanks for all you do!! Hi Emily, I had a question about this recipe. You say to use 6oz of chicken, is this raw or cooked? I have been love pizza chicken roulades.